My curiosity went on high alert and I rented the DVD asap. Central to the development of the Highwaymen was white artist, A.E. 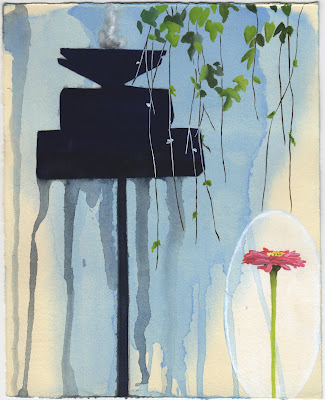 “Bean” Backus, often referred to as the dean of Florida landscape painters. Backus studied painting at Parsons in New York and soon brought the Hudson River Style to the big skies and Everglades of Florida. Despite the predominant racial prejudices and segregation of the 50’s and 60’s, Backus was willing to help any young student who wanted to study to become an artist. One of the first African American artists that “Beany” took under his wing and taught his painting techniques to was Harrold Newton. Newton learned quickly and would sometimes paint as many as three or four paintings a day. No respectable gallery would show the work of an African American artist, so Newton began going from door to door, often bartering his work for rent, medical treatment, groceries or gas. In 1955 an art teacher at Ft. Pierce’s segregated Lincoln Academy recommended another student to Backus, a young African American man named Alfred Hair. Hair is often credited with being the founder and spiritual leader of the Highwaymen. Hair wasn’t satisfied with the painstaking brush painting of Backus or selling an occasional piece of work. He wanted to speed up the process and make money. So he developed a technique of painting faster using a palette knife with looser strokes. He painted on inexpensive construction materials, primarily Upson board and later Masonite. Old window and door frames were used for framing. To gear up production, Hair soon began recruiting neighborhood kids to work for him, many of whom went on to become the original group of artists now referred to as the Highwaymen. They saw painting as the road to financial freedom and churned out work, factory-style, at an amazing rate, with some claiming that there are over 200,000 Highwaymen paintings in existence. Why work in the fields picking oranges for $6 a week, when you could sell a single painting for $10-$15? Hair, well on his way to fulfilling his dream of becoming a millionaire, was tragically murdered at the age of 29. His group of followers were deeply affected by his death and lost some of the momentum he had created. They continued to paint, however, and the original 26 members went on to become inducted in the Florida Artists Hall of Fame in 2004. 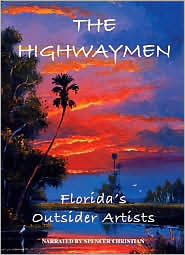 Prices for the paintings of the Highwaymen sky-rocketed in the early 2000’s, primarily as a result of bidding, buying and selling on EBay. Some of the works by the original 26 members of the group now sell in the five-figure category. Thanks for sharing this. I tweeted it and added it to my FB page. I can't wait to see the documentary for myself. Thanks for sharing. PS. I have a solo show coming up. Please stop by and say hello if you have a chance. it'd be nice to meet in person. Otherwise I'm going to try to make it to Lisa Adams exhibit. She's awesome. Also, I'm starring on the premiere episode of HGTV's new show Selling LA "The Artist" airing on Oct 13 at 10p and 1am. Thank you Jane. I am ordering through Netflicks right now! A good fine indeed. I saw the video it shows that so thing are ahead of their time. they were doing the wet on wet then . Though I am an artist myself, I don't usually enjoy reading art blogs but I really like yours. It has a sense of fun about it.